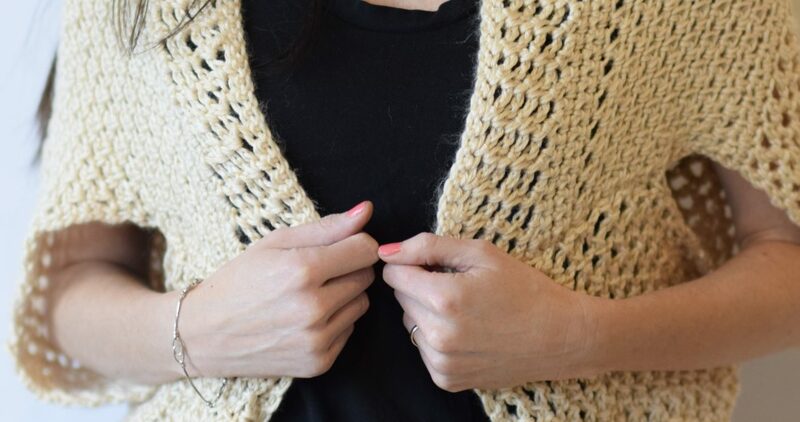 The mix of textures really make the stitch work pop, don’t you think? I think it’s great for winter or summer. I’ll put a long sleeve on underneath for winter and plan to wear a tank or t-shirt under it during the summer. What else do I like about this particular blanket sweater? It uses less than 3 skeins of yarn which makes it really affordable. The hubs always likes an affordable project which scores me brownie points at home. **It is necessary to block this sweater for the shape to be correct. The stitch is a nice, open mesh, but it will pucker. By blocking it, you can get the blanket to lay flat. The other option is to make this with the “two stitch small mesh” that I show you in the video tutorial that you may click on below. This medium weight blanket sweater is perfect for wearing on a night on the town or for going out to coffee with friends! 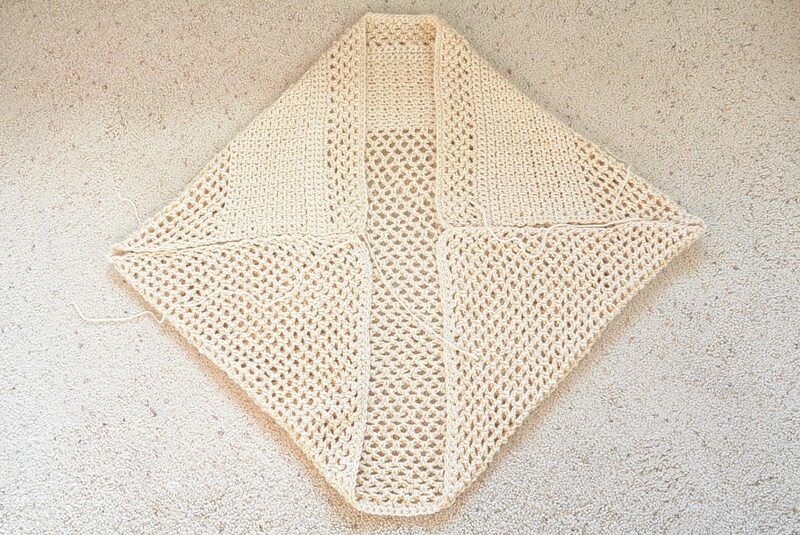 The beautiful open mesh is super easy to create and can easily be dressed up or down. Wear a tank or t-shirt underneath it during summer, or a long sleeve shirt with it in the winter. Using a variety of very simple stitches you’ll make eye catching textures and a comfortable, lightweight top at the same time. Enjoy! Don’t forget to check out my two stitch tutorials for this pattern! The Mesh Stitch Tutorial can be found HERE and The Granite Stitch Tutorial is HERE. As written, this pattern fits XS – M. I hope to make tops with various sizes in the future. Some of you might be able to figure out adding some extra length and width to fit a large or xl, etc. 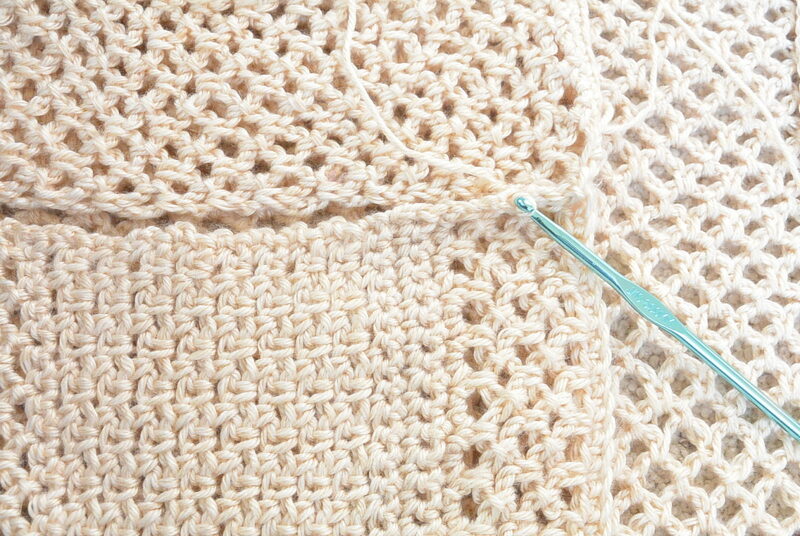 Adjustments may be made by creating a longer chain and crocheting for more rows. Gauge is listed below. When flat on the floor (after blocking and as pictured below for seaming), the shrug measures 32” inches from end of sleeve to end of sleeve. It measures approximately 29” inches from top of shrug to bottom of shrug (It stretches slightly downward when worn). Above Amazon suggestions are affiliate links – thank you! 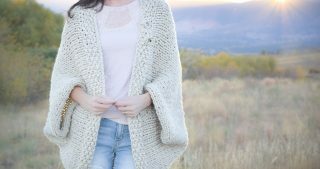 The blanket sweater is created with three different stitch patterns. 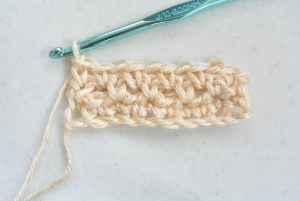 You will use single crochet, the moss stitch or granite stitch and a simple mesh stitch. They each use variations of single crochet and chain stitches. The gauge on the moss/granite stitch portion of the pattern may be tighter than your gauge on the mesh stitch portion. Crochet loosely for the mesh stitch portion. Also, it may be necessary to block your finished sweater to make up for difference in gauge. I simply made my sweater damp, shaped it nicely, laid it on the floor and placed a couple of heavy items along the sides to hold them down. Please block before seaming the sleeves. There are many methods and ways to block your projects, so use what works best for you. It is necessary to block this for the shape to be correct. The blanket sweater is worked from the top down. Row 12 Sc in second stitch from hook, *ch 1, sk st below, sc in next ch 1 space below. Repeat from * across row, make an sc in the last stitch of row. Ch 1, turn. Repeat row 12 for 18 rows or until you have created approximately 5 ½ “ inches of moss/granite stitch. Once you have finished the moss stitch portion, you will move onto the largest part of the blanket sweater, the final mesh portion. Row 2: slip stitch in fifth stitch from hook (in other words, skip the first stitch of the foundation row), *ch 3, sk st, slip stitch into next stitch; repeat from * across to last stitch. Ch 3, turn. Row 3 sl st into 1st group of ch 3 stitches below, *ch 3, sl st into next group of ch 3 stitches below. Repeat from * across. Ch 3, turn. Repeat row 3 until you have made approximately 20.5” inches of final mesh stitch or approximately 53 rows of mesh. Block to shape. This is necessary to make the mesh stitches match with the granite stitch portion. Place piece flat on the ground lengthwise like a hot dog. Fold in sides as pictured below. Attach yarn to the end of sleeve and seam with a slip stitch, 5.5″ inches in on each side. I only grabbed one “leg” of each stitch from both sides to create less bulk at the seam. I imagine that a whip stitch could work well here too if you prefer. The fabric is reversible, but seam on the wrong side of the sweater so that you will turn it inside out after seaming. Tie off and weave in ends. Above: You can see how it was laid out flat and folded in at the corners to make the sleeves. 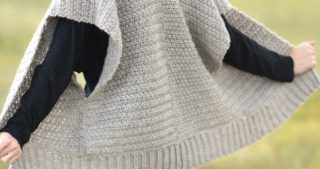 You will make a slip stitch seam from the inner portion of the sweater toward the pointed ends of the outer sleeve. Seam approximately 5.5” inches in on both sides. Turn sweater right side out. I sure hope that you enjoyed this blanket sweater! 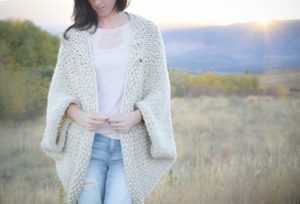 If you like this, you might also like my chunkier versions including the Easy Blanket Sweater, The Light Frost Crocheted Blanket Sweater and the Knit Version as well! Also, if you love the look of the moss/granite stitch, you might also love Stephanie from All About Ami’s Granite Cape! Have a great day friends and happiest crocheting to you! This is so beautiful! Will be a great springtime in the Rockies sweater for me!!!! Can’t wait to make it!!!! Thank you for all your great patterns!!!! Thanks so much Trish! I’m so happy that you like it! How about some of these patterns be made for us plus sized ladies? Love your patterns but they aren’t suitable for us larger ladies. Hi Kathy! I totally feel your pain because I’m so small that often times I can’t find clothing or patterns suitable for my size. This really started as a personal blog where I share my projects that I make and I don’t always have the time to do all the math and figure out sizing for each person. However, I am hoping to do more multi-sized patterns in the future. 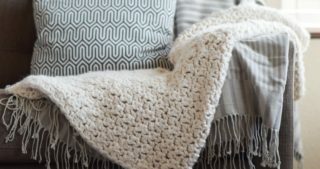 Many of my readers have been successful in making larger blanket sweaters. Simply make a longer chain, keeping an odd stitch count, and guesstimate the extra length and rows you might need. I’m so glad that you like my patterns and thanks for reaching out to me! Thanks for quick reply. I will take your advice and try enlarging the pattern. Wondering if you ended up enlarging this pattern and how it worked out for you if you did. I too am plus sized and would love to try this in a larger size. I was wondering the same thing. I can’t adjust on my own so I rely on patterns. It would be helpful to me as I would like to try this pattern and make something for ” me”! I gotcha Betty! I will make sure to keep the sizing thing in mind for the future. 🙂 Thanks so much for your understanding and for letting me know. 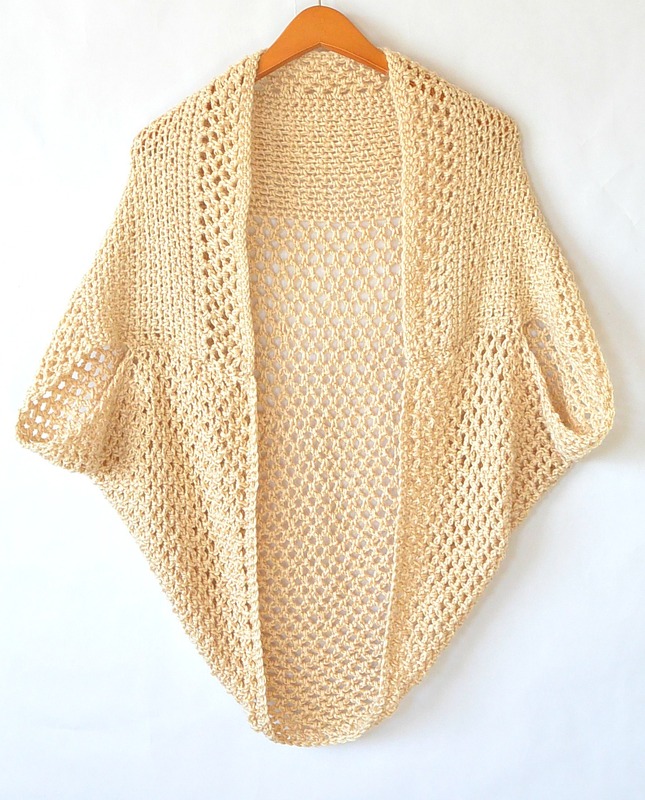 What a beautiful cardigan!! Love it!! Thanks so much Julie! You’re always so kind! This is SOOOOOOOOOOOOOOOOOOOOOOOOOOOOOOOOOOOOOO cute!!!!!!!! Totally the perfect thing for spring! (Or just the heat in general, since the lowest temperature where I’m at is mid-seventies). Your blanket sweaters are beautiful! This new one is my favourite – I love the lightness of it! Great for late winter/spring here in Canada! Can’t wait to see what you make next! Thanks! I’m so glad that you like this one Shannon! I think you’re right; it’s really practical in the lighter weight. My in laws live in Canada! You’re welcome for the pattern and thanks so much for taking the time to let me know you’ve liked the blanket sweaters! I so love this sweater. This is the second that I have made and my daughter is working on a version for my young nieces. They are turning out so beautifully. Thank you for the simple yet great advice! That’s so wonderful to hear! What lucky little nieces. Thank you so much for taking the time to let me know that you’ve enjoyed the sweaters Jane! Yes, you definitely want to increase the chain as well as the number of rows so that you still have a rectangle of sorts. You’ve got it!! I hope that it works out well for your Sandra! This is beautiful! I am looking forward to making it. Thanks Cheryl! I’m so glad that you like it. Remember that it must be blocked to be shaped correctly. I’m going to make another note in the pattern as well! Enjoy! Hi Elena! I’m so glad. Just be sure to block it! It must be blocked to lay flat. Enjoy! Yes! 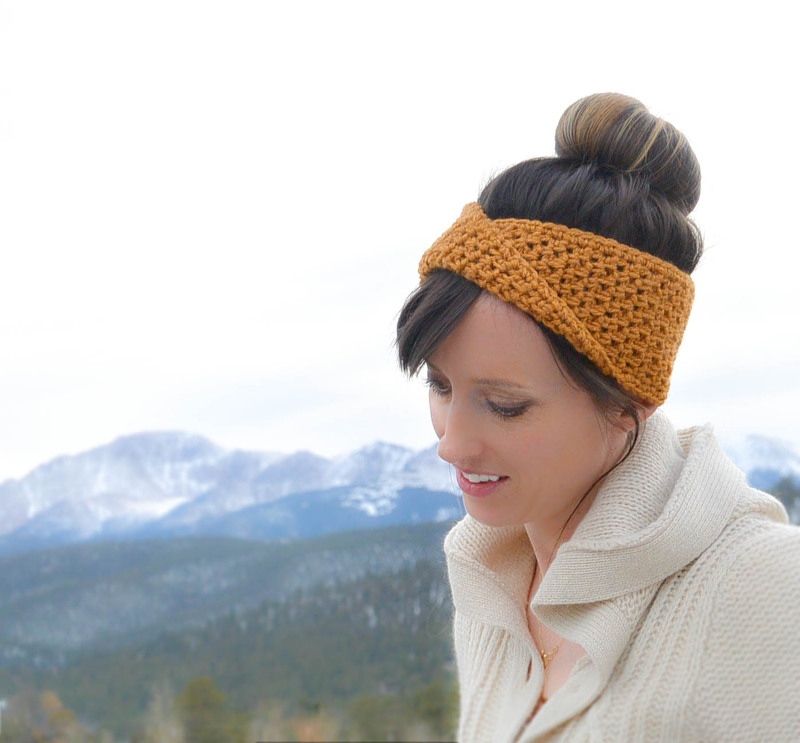 You can find the link to the video tutorial for this stitch above in the post. 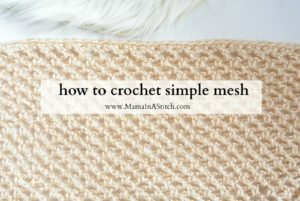 Look for the Video Of The Mesh Stitch.. Hope this helps! Hi! Wonderful blanket sweater. I’ve been wanting to knit the chunky version but using a lighter yarn weight like this one since I live in a tropical country. Looking forward to the knit version of this blanket sweater. I tried converting the chunky knit version but I was not confident about how many stitches to cast on and for how many rows. So I set it aside for a future project or until I find a pattern. Hi Kelsey!! I’m glad that you liked it and that you like the yarn. It’s a good one for sure! Sorry it turned out smaller than you thought, but I’m glad that you like it enough to make a larger one. Thanks for taking the time to write me! 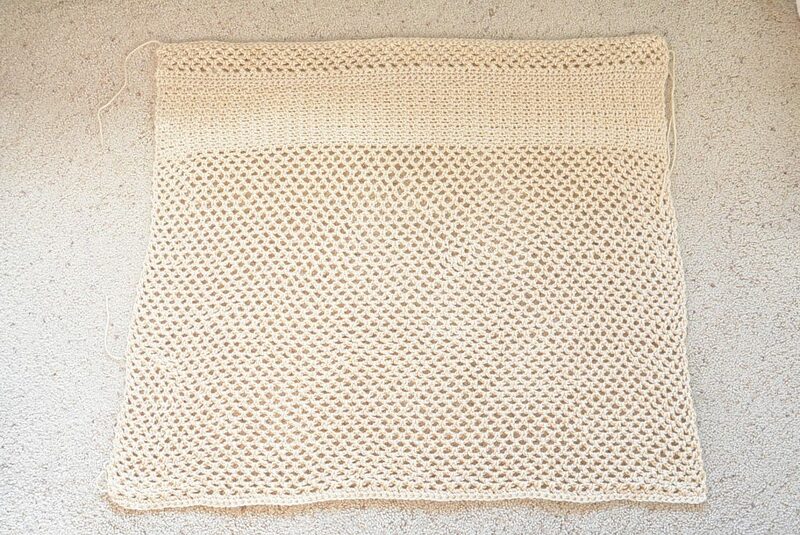 I am having an extremely hard time trying to get the crochet pattern for your blanket shrug. Your website quits responding, and it won’t load. I tried for over an hour with no success. How else can I get your pattern? I’m frustrated. I have subscribed to your blog. I will need to make this bigger so I will keep track of my changes. 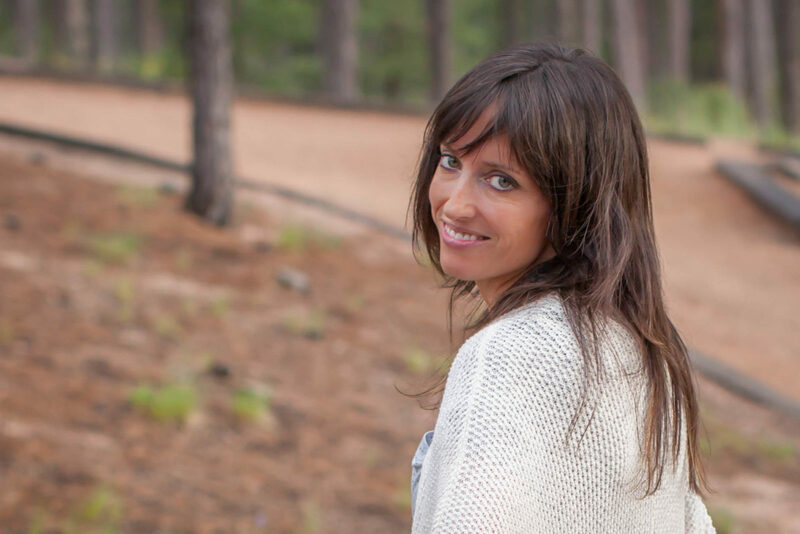 Sorry for the trouble Shelley – I haven’t had any other complaints about the site not loading so I’m not sure what’s going on. I hope that it stops for you so that you can view the pattern! I will look into if there are any issues on my end of things with the blog. Thanks for letting me know and sorry for the frustration! I have completed the pattern, which is beautiful by the way, but it is obvious that my moss stitch is tighter than my mesh stitch. I’ve never blocked before and I’m wondering if you have any advice for me. I have done some research and am vaguely familiar with the wet techniques out there, but I don’t know anything about the dry techniques. Also, I don’t have a blocking mat or anything. Any tips? Hi Amanda! With this piece, I simply took a spray bottle with water and sprayed it until it was damp. Then stretched the moss stitch portion to match the mesh and laid it flat on towels. Then I placed some colorfast heavy glass items along the sides to hold it down until it dried. That’s it’s! There are much better methods out there but this worked for me. You can do a google search on easy blocking methods and find a lot of info! Good luck! This is so beautiful & easy to make, thank you for sharing. Hi Ivette! 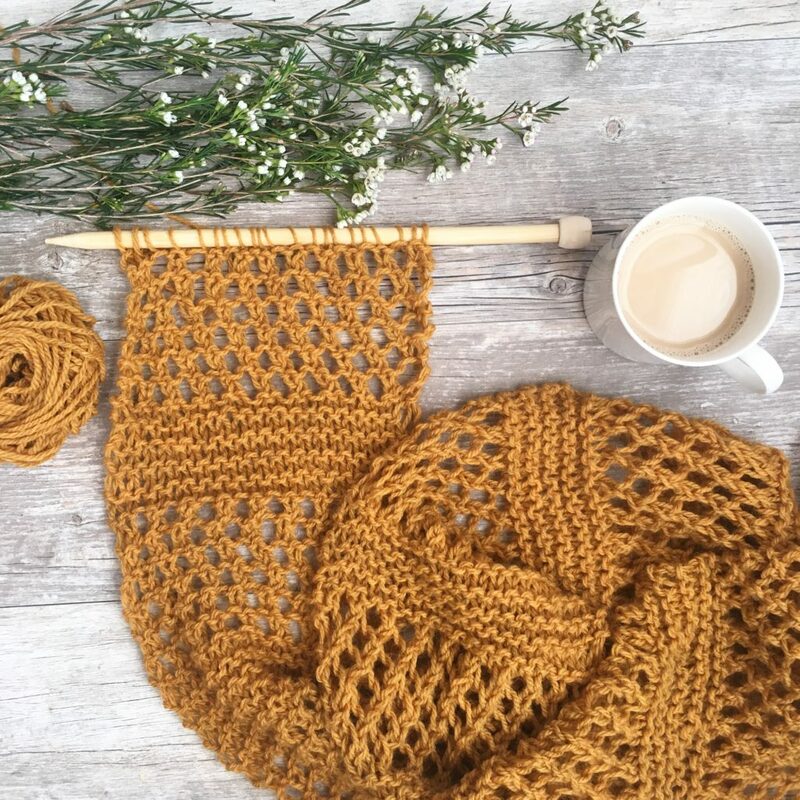 I’m so glad that you like the pattern enough to try, even when you are new to crochet! Hope this helps a bit! Your tension could be different than mine as well which can change the size of your finished piece. 😉 Good luck! I was curious if you had measurements for how big you blocked your sweater. I am ready to block mine but was not sure about the final mesh area. I didn’t know if I should stretch it a bit of keep it around the 20.5 inches. When flat on the floor (after blocking and as pictured below for seaming), the shrug measures 32” inches from end of sleeve to end of sleeve. It measures approximately 29” inches from top of shrug to bottom of shrug. I am a person who don’t know how to read partens so I really like to make it I am more to see a video of the sweater . Why does it say that your videos have been removed by the user? Hi Deborah! Thanks for the heads up. I just fixed the link, so it should be working now! How many stitches would you start with if you would like to make a large? P.S. Are you going to make a video on how to make this? Oh dear! That’s no fun. Are you making a sc in the last stitch of the row? That could be easy to miss! I hope it’s something that simple. I’m not planning to make a video on this, so I’m sorry about that! Hope it works out for you Terrie! I’m still trying! LOL Newbie here… What I should have asked was, Once you SC in the last stitch, is that CH 1 (turn) considered the 92nd stitch? (If that makes sense to you) lol I do end up SC in the last stitch, but when I count my stitches there are only 91.. that’s why I want to know if that CH 1 is considered the 92nd stitch. I’m not giving up… I’ll get it. Hi, I love this pattern. I’m on row 24. Instead it the same hook, I used a larger hook for the collar and will on the rest of the mesh stitches, and the 6′ hook on the moss/granite stitch so the edges lined up. Do you think that would work out ? My measurements for width are still the same. Hi Debbie – It’s a good thought, and I hope it works, but I’m not sure if that will be enough to make it so that it won’t need blocked. You might just have to work it in order to find out. It would be great if that would work! I love this blanket sweater. 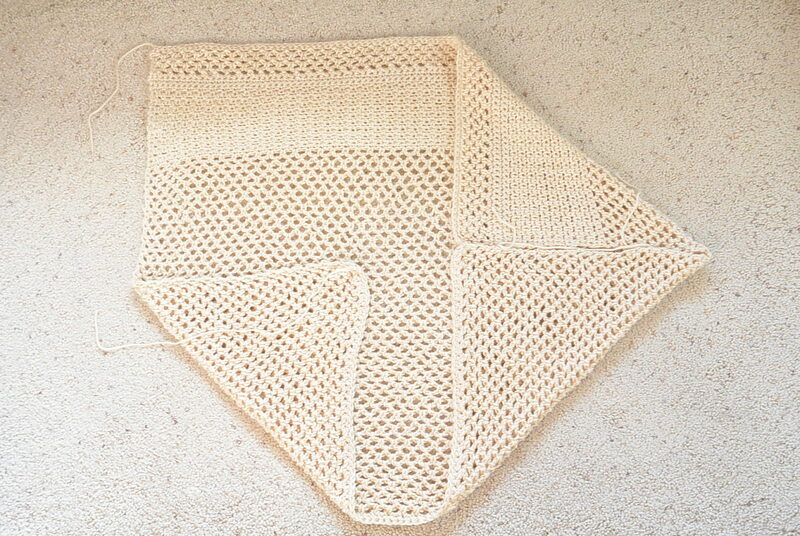 I am going to try making one with Caron Cakes, I hope the color changes will look beautiful. Thank you so much for sharing with us. Should I get foam squares to block this? How do you block yours? Foam blocks would be great! All I did with mine was make it damp all over, lay it out on flat towels on the floor to shape it, and held it down on the very edges with some heavy glass items (colorfast items so you don’t risk any dye transferring to your piece). My method isn’t the best way to block, but it worked for my purposes. You can do a google search and find other methods that you might like as well! I’m so glad that you like the sweater! I may be listing it in my Etsy shop sometime soon. Thanks for asking. Currently, you have to copy and paste it to print it. Again, thank you for such a beautiful springtime cardigan. Hi Erin! Thanks for the feedback and help for those making a larger size. I’m so happy that you liked the pattern and found it to be pretty! It means a lot to me that you took the time to write me. I will have a look on Ravelry here in a bit! Thank you for this comment, I wondered what I did wrong. It looks so huge in the photos but mine came out really small on me and I wear a size 8! Blocked it and everything. Wonder if I add some finishing rows all around if that would help. (Don’t want so many hours going to waste.) It is an interesting concept though. Hi, thanks for the great pattern. On row 2, when it says to slip stitch then chain 3, do you chain 3 in the same spot as the slip st or in the next stitch? Hi, I would love to make this in cotton since I live in Atlanta…..do you have a pattern for a lighter weight yarn? I am afraid that if I follow this pattern with a cotton yarn, it will run small. As long as it’s a cotton, worsted weight yarn it will turn out about the same size depending on how loose or tightly you crochet. Also, you can always go up one hook size to make it a bit larger as well. Good ideas, thanks so much! My favorite one. Thank you for the pattern. You’re welcome! Thank you Laura! i love this and am planning to make this next. However is there a ww 4 yarn you know of that isn’t so expensive? 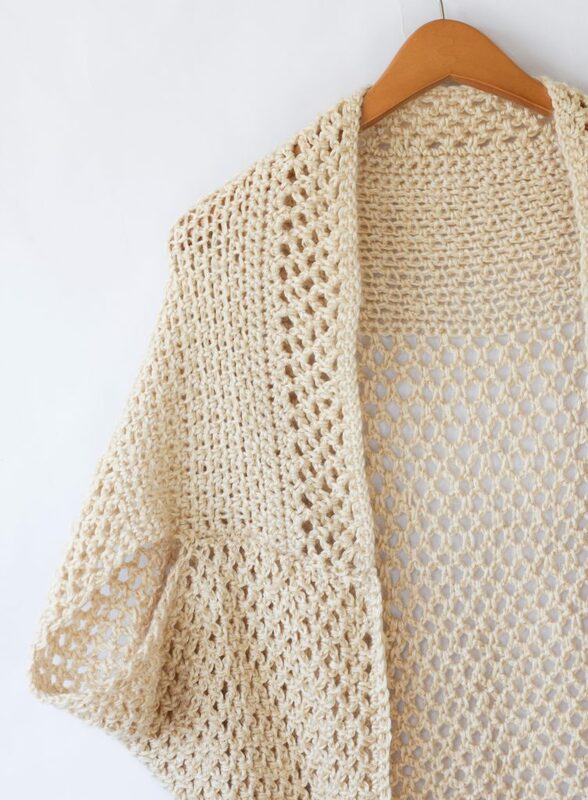 I would love to make this yet Lion Brand heartland yarn is about 10 dollars per ball. I have another question. 🙂 I’m a little under a halfway through with the final mesh portion, but the mesh stitch is a lot tighter than yours looks. I’m using the correct hook size and yarn ww, but I’m wondering if I block and wet it like you did will it loosen up? I love working this pattern. I do think my stitches are tighter. It is measuring 28 inches before finish and blocked. Concerned maybe I should redo with larger hook. It’s fun and easy to do so I don’t mind. Do you have measurements prior to blocking? Also glad for the one hint to increase by nine. Might do that! I made your Mod Mesh sweater and LOVE it! I bought Lion Brand’s Heartland ‘Arcadia’ for $1 a skein. It worked up beautifully. Thank you for the pattern. Yes, I’ve given you credit everytime I posted. I’d love to show you the picture of it, but I can’t find where to attach it.